Each year the National Venture Capital Association and Thomson Reuters release data characterizing the state of the startup market. I’ve analyzed the 2013 data and there are three important trends I observed. All in all, the startup exit market is quite healthy. Startup exit values are increasing more than 7% per year, on average. 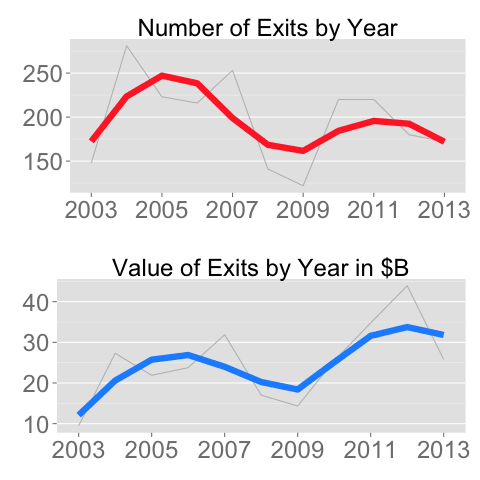 The number of exits is flat-to-down during the ten year period I studied. The public markets have opened to startups again, doubling their share of exits. 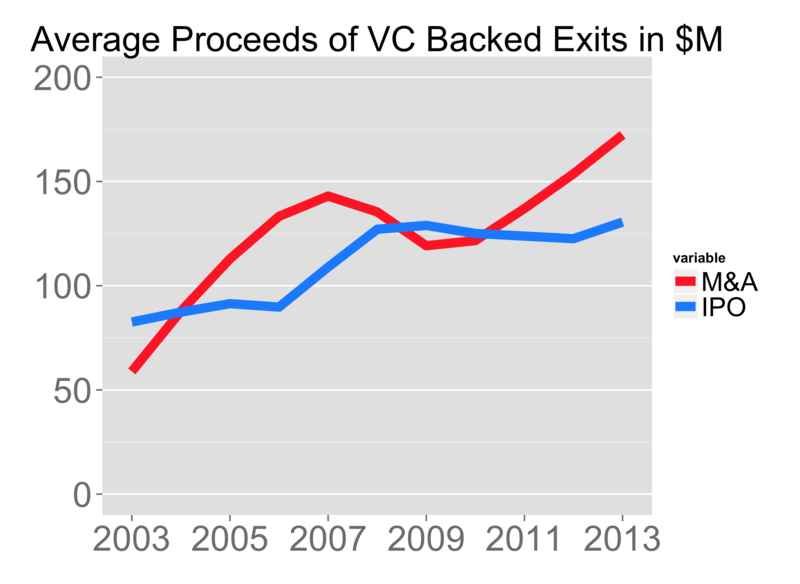 Over the past 10 years, startup exit valuations have increased 7% for IPOs and 10% for M&A annually. If the trend continues, in 2014 the average material startup acquisition will reach $178M and the average startup IPO will raise $146M. Let me explain the phrase material startup acquisition. The average M&A price I’m quoting isn’t an average across all startups. The data set I’ve used includes only disclosed acquisitions, which are acquisitions that represent greater than 10% of the acquirors asset. The data set is skewed this way because publicly traded companies are only required to disclose these acquisitions by the SEC. Below is a chart comparing the total number of exits, both IPOs and major acquisitions, with the aggregate value of those exits over time. There are fewer exits but they are larger exits. I suspect this is driven primarily by the strength of the IPO market. Public investors have embraced startups and enticed them to go public instead of selling by offering cheap cash at hefty multiples at IPO. Growth stage investors, including hedge funds, have provided the extra growth capital to finance startups to IPO. This shift to IPOs is plain to see in the data, as the chart below shows. 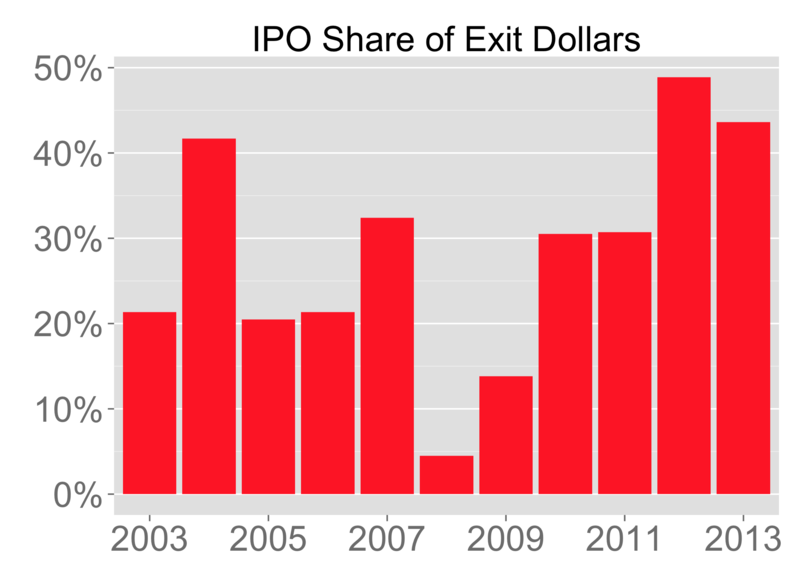 During the past two years, IPOs have nearly doubled their share of exit dollars to 45%, compared to a ten-year average of 28%. As a result, the corp dev teams of acquiring companies have to pay larger premiums to startups to allure them and instead of defraying their dollars over a large number of targets, these acquirors focus on fewer, more strategic bets. There were only 90 major acquisitions in 2013, compared to a ten-year average of 144, a 40% drop and statistically significant at 93% confidence. The data is almost universally positive for startups. Each year, startups’ exit price grows 3x faster than inflation. The public markets are more receptive to startup IPOs than at any other time in the past decade and the aggregate value of startup exits is on the rise. The only mildly negative data point is the volume of exits has fallen by 11%.